The developments in the field of agriculture and the efforts for the betterment of farmers made under the guidance of Prime Minister Shri Narendra Modi are bearing fruits. The efforts of the last 3 years have brought about a qualitative change in the life of farmers. The Modi government has brought about a new methodology and a transparent work culture. 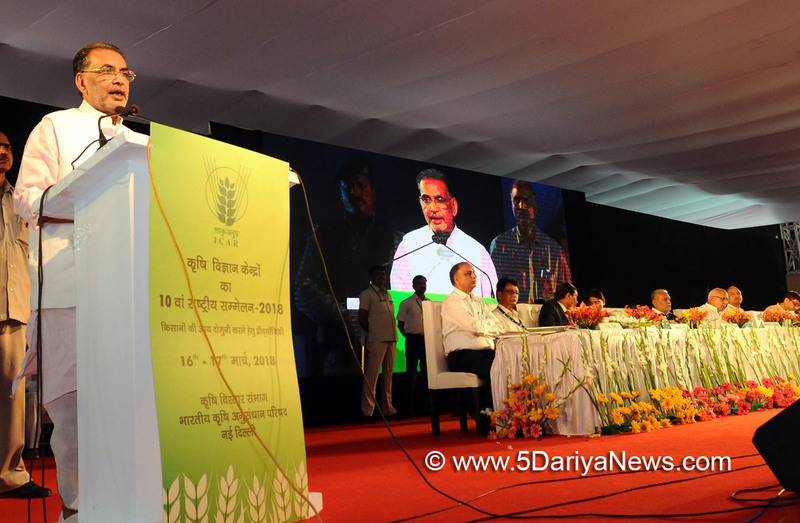 This was stated by the Union Minister of Agriculture and Farmers Welfare Shri Radha Mohan Singh at the Valedictory function of the KrishiUnnatiMela 2018.Shri Singh further said that the government has acted in a time bound manner under the guidance of Prime Minister Shri Narendra Modi. The schemes for farmers’ welfare are being implemented in mission mode. The new methodology of good governance, new ideas and an improvement oriented vision will pave the way for modernisation of farming in a new India.The Modi government has been successful in changing the mind-sets of farmers and increasing awareness among them. To improve the financial status of farmers, Prime Minister Shri Narendra Modi has kept a goal before the country of doubling farmers’ income by 2020. This is the first time that the Prime Minister has put a concrete goal of welfare of farmers. Under the leadership of PM Modi, the Agriculture Ministry is determined to accomplish this goal by 2022 and is working with full commitment and honesty to achieve this goal. Shri Radha Mohan Singh said that the central government is working with speed towards doubling farmers’ income by 2022. An inter-ministerial committee has been constituted under the chairmanship of CEO of National Rainfed Area Authority, Agriculture cooperatives and Farmers Welfare Department on 13.04.2016. This committee has beengiving suggestionson various interventions and processes to be followed which will be implemented through the state governments.Among the dignitaries present on the occasion of the valedictory function of the KrishiUnnatiMela 2018 were Shri ParshottamRupala, Minister of State of Agriculture; Smt. Krishna Raj, Minister of State of Agriculture; Uttar Pradesh Agriculture Minister Shri Surya PratapShahi; Secretary, DARE & Director General, ICAR, Dr.TrilochanMohapatra; CEO National Rainfed Area Authority Shri Ashok Dalwai.